Dies R Us: Simplicity At It's Finest! Happy Tuesday Dies R Us Fans! Darlene here to share a QUICK & EASY inspiration card with you! If you're anything like me, no matter how many cards you have in your stash, you always need 'something different' that you have to make 'right away'. Well, here's a birthday card that I think is both elegant and quick to create. Utilizing the following dies from our Dies R Us store. Remember, if by chance the item you are looking for is out of stock, be sure to click on the 'Put Me On The Waiting List' button to be notified when it becomes available. IF you need it in a hurry, be sure to check some of the other companies we have listed to see if they have something similar. At these prices, you can't go wrong!! My choice of design paper today is from the Paper Studio ... Harper's Boutique. Red Stickles was used for the flower center and 'dotting' the I. Like I said ... Simplicity at it's Finest! Please be sure to stop back again tomorrow to see what Sherri has created to inspire you! New product & companies being added all the time at our store ... we'd love to have you come shop with us!! Great quick & easy card, Darlene! Love that frame die! That may have to go on my next list! Hi, Darlene! 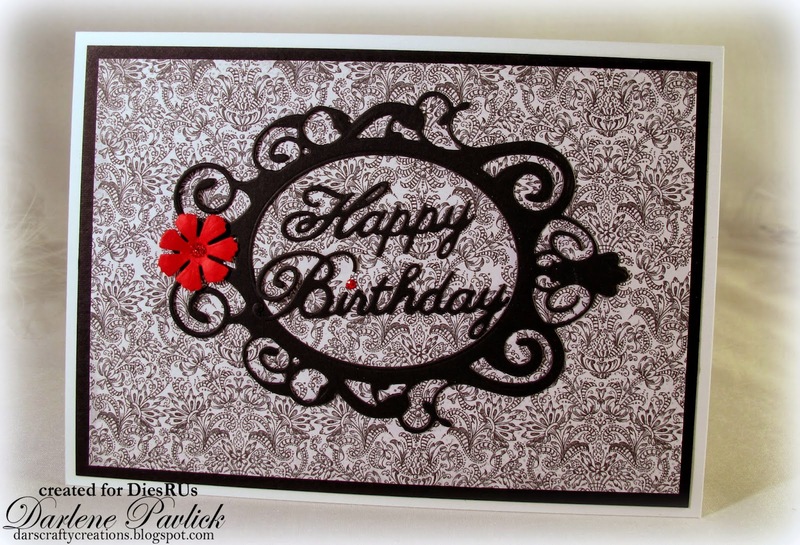 Beautiful use of the pretty die for making a card with lots of character that's also mail friendly. I love how you used the red Stickles to dot the "i", and the red flower gives the whole card that extra "oomph". Thanks for mentioning the waiting list, too.